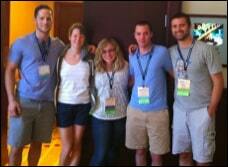 ALEX BURDAY and ALEX SPIRER join the StutterTalk B Team from the annual National Stuttering Association (NSA) conference in Fort Worth, Texas. This episode was recorded and posted on July 8th 2011. CARYN HERRING, JOEL KORTE, and ROISIN MCMANUS (the Stuttertalk “B Team”) are joined by Alex B. and Alex S. who are both “first timers” at the NSA. StutterTalk would like to thank the National Stuttering Association for all of their support and assistance in making these episodes from the NSA annual conference possible. During this episode the team discusses their favorite workshops, the experience of attending the NSA for the first time, how impressed they were with Neal Jeffrey’s keynote address, avoidance reduction, remembering childhood, when parents chase fluency and so much more.